The electrodeposition of actinide samples for alpha spectroscopy provides a thin sample layer that is a prerequisite for optimal energy resolution. The use of this technique has been restricted, in part, because no commercial, multiple-station apparatus has been available. The electrodeposition procedure itself is not a selective technique for a particular actinide element but is easily compatible with popular separation techniques. 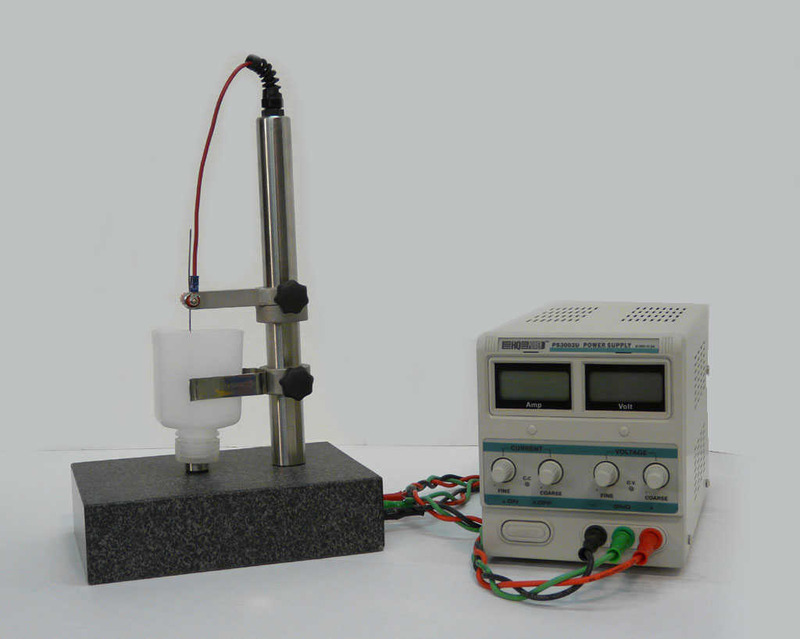 Electrodeposition has significant advantages over precipitation methods that by definition add significant mass, which may not always be firmly attached. The mass may also provide an opportunity for acid carry over which, over time, can damage expensive detectors. 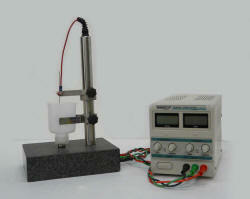 Economical cells are constructed from commonly available plastic lab ware. A 20mL polyethylene, liquid scintillation vials with the bottom removed makes a 3/4inch(19mm) planchet and a 125ml square bottle with its bottom removed makes a 1inch (25mm) planchet. The standard caps are replaced with one that has a hole in the top for contact to the electrode. A 3/4inch polished, stainless steel planchet is inserted into the cap with the polished side toward the solution. A platinum wire forms the other electrode and is anchored to a binding post at the top and has a "foot" formed just above the planchet. 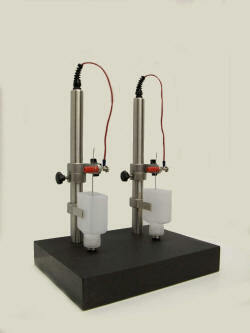 Agitation is automatic due to the bubbles from electrolysis. The user can adjust and monitor the current for each cell on its own individual meter. For the EP series all cells are wired in parallel so that you use only the number you need at any one time and one cell does not effect the others. For the EPX series each cell has its own constant current power supply. 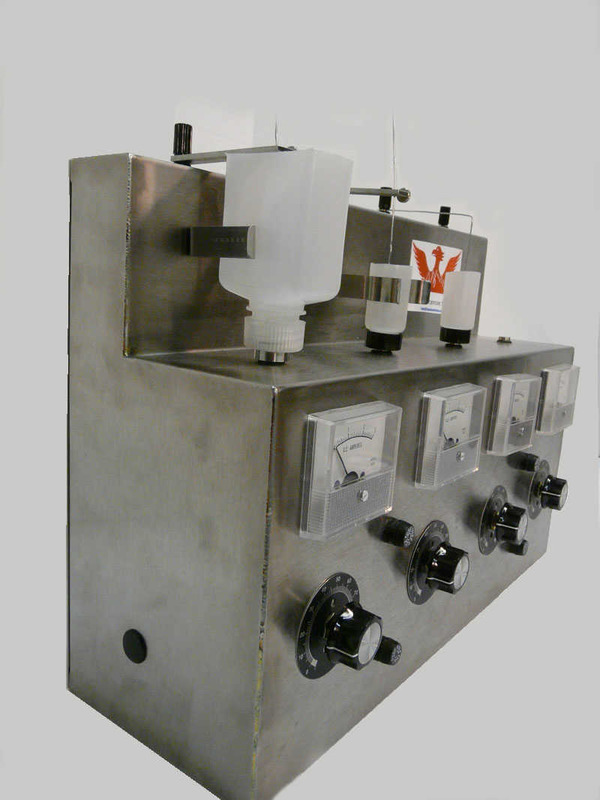 Electrodeposition systems are available as 1 or 2 position EPX series or as 4, 6, 8 or 12 position EP series depending on the number of samples that you are processing. EP series systems can be set up for either 3/4inch(19mm) planchets in 20ml LSC vials or for 1in (25mm) planchets in a 125ml square bottle. Optional support clips are available for both configurations and an optional stainless electrode arm reduces the length of platinum electrode wire required. 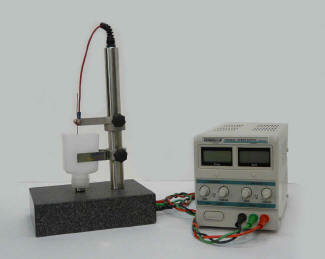 Note: Platinum is not included; see optional electrode arms, below. 12 x 24 x 26"
12 x 24 x 36"
70 lbs. 12 x 24 x 48"
and Planchet. 1 220V 50/60 Hz systems all come with a 30A power supply with a detachable, universal power cord. Non-US customers must supply their own power cord to fit the universal socket or modify the US standard cord to fit their local plug. Ask for your copy of the Phoenix Scientific Sales Electro-Plater Apparatus Accessories list for suppliers and typical prices for Platinum, vials, planchets and other accessory items. EP series systems can be set up for either 3/4inch (19mm) planchets in 20ml LSC vials or for 1in (25mm) planchets in a 125ml square bottle. Optional support clips are available for both configurations and an optional stainless electrode arm reduces the length of platinum electrode wire required. The EXP series comes in single station or dual station versions. These units are ideal for teaching or method development. the 0-3A and 0-30V power supply accommodates a wide range of solutions for maximum flexibility. For production work, see the EP series.